Today I was impressed by the biennials in my garden. 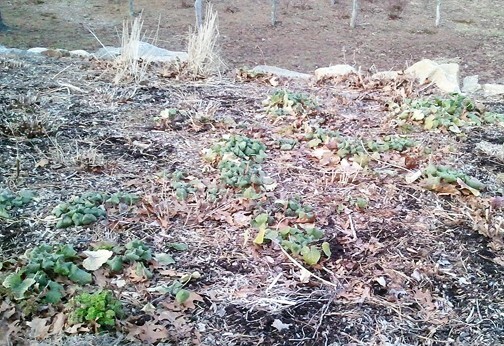 The perennials are either completely dormant or staying close to the ground. This allows the biennials to dominate and they are taking advantage, soaking up the sun while other plants sleep. One bed is dotted with Lunaria, another with various Verbascum and the entry garden is filled with feverfew. These are all green. They predominate. (Note to self: when I clean out these beds in a month or two, pull most of these self-seeders from the front of the beds.) Biennials only have two years to grow, flower and make seeds so I suppose that it makes sense that they make the most of what time they have. I love these plants. They wander and weave through the gardens and add both an element of surprise while still being easy to edit where they aren’t attractive. Because their presence in the garden demands both spontaneity and control, they’re a perfect a metaphor for the creative process. Sometimes creativity waits patiently through dormant periods, waiting for the right time to grow and bloom. It is tough and willing to germinate in the most unlikely places. But like my biennials, imagination frequently benefits from being either cultivated or controlled. Effort, intention and attention pay off. You'd never know that this bed is filled with perennials...right now, only the Lunaria shows. This allows me to see it more clearly, so I can make my editing plans with ease. Just because something seeds in the garden (or in our lives) doesn't mean we have to let it stay.